There's been a lot of change going on in the past few days. I officially moved out of my apartment today. I'm also selling my lovely, beautiful White Stallion. In case you don't know, it's my beloved, nearly 16 year old car. I've driven the White Stallion for almost 6 years. It was my first ever car. My grandparents generously gave it to me for my 16th birthday, and I fell in love. I remember the very first day I ever drove by myself in that car, December 6, 2007. I was afraid to cross over split highways or change lanes, so it took me almost 15 miles to drive to school (which was normally only seven miles away). That day--and probably the first few weeks-- I avoided every split highway, only took right turns, or turned at places with a left turn arrow. I remember my senior year, when my high school boyfriend and I had the exact same car (in make and model) in the exact same color. Before we dated I even used the COMPLETELY LAME pickup line of: "Nice car..."
I remember the trips across country from Tennessee to Arizona, Arizona to Tennessee, and from Tennessee to upstate New York. Eating way too much, laughing in copious amounts, and listening to great music all along the way. I made a video of one of those trips, just in case you'd like to waste three minutes of your life. I remember when I got my first flat tire after hitting a curb. I cried so hard in a crowded parking lot. Everyone probably thought I was crazy. I remember driving home in the snow once. I was so scared and also pretty dumb for driving in the snow. Let's just say "black ice don't play". I remember the countless times I sang my heart out, cried like a baby, and giggled like a little girl in that car. These brownies have nothing to do with the White Stallion. If cars could eat (could you imagine how expensive that would be? ), I would make these brownies for my the White Stallion. I want to thank my wonderful little Honda for driving me 40,000 miles and keeping me safe. This is the part of the post where you roll your eyes and quickly click off the page, hoping no one saw you reading about the crazy girl that wants to make brownies for a CAR! Tell me about YOUR first car! These brownies are rich, chocolatey, and sooooo easy. I've been using the base recipe (I got it here) so much and adding different toppings/mix-ins to suit different tastes. 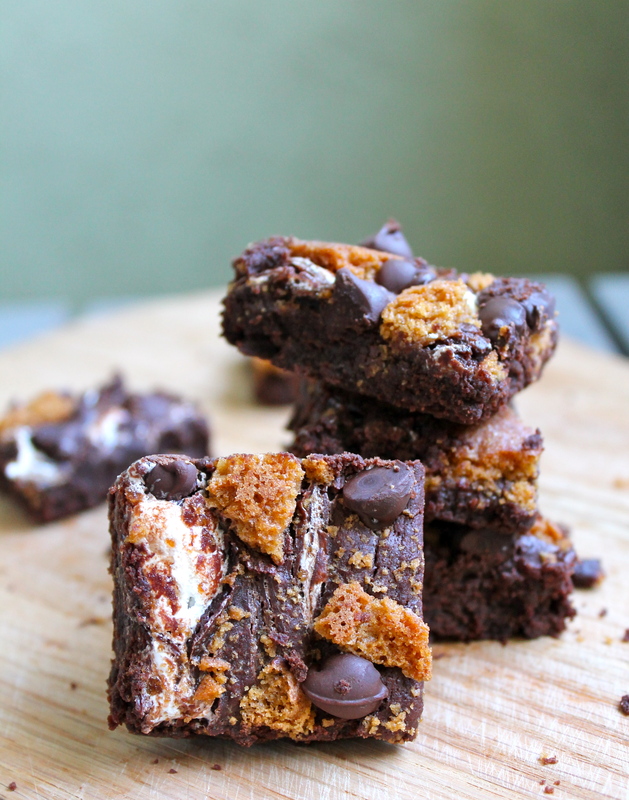 The crunchy graham crackers soften a bit in the oven, the marshmallow cream gets nice and toasty, and the chocolate chips melt to perfection. 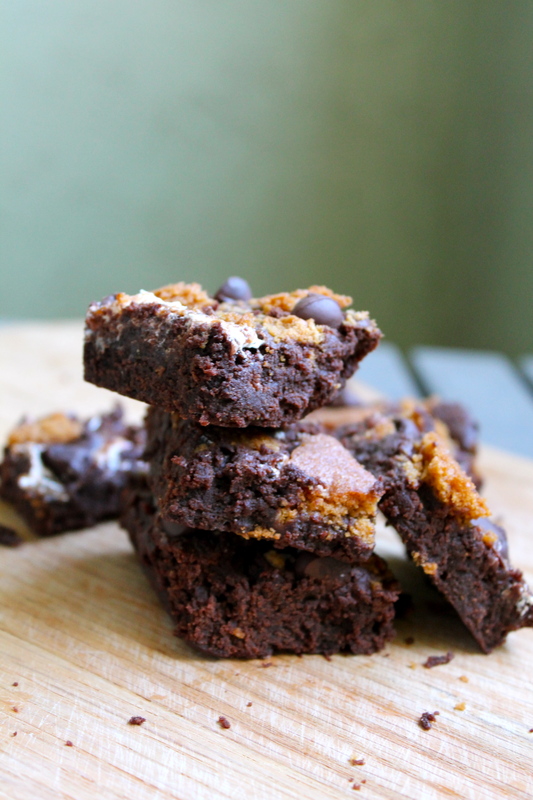 To make them your own, you could try using a different flavor chip or mini peanut butter cups. You can also use marshmallow cream or mini marshmallows. 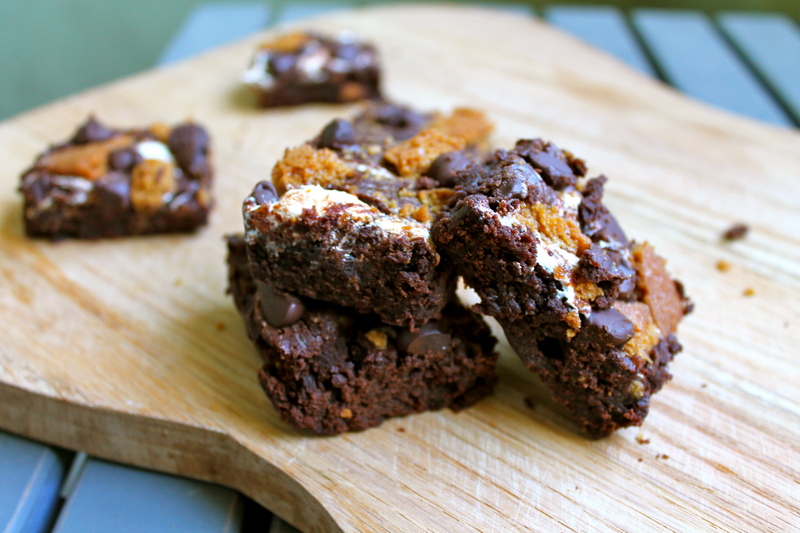 I liked the marshmallow cream because I swirled it into my brownies, but anything goes. Consider adding these to your next baking adventure. You won't be disappointed! 1. Position a rack in the lower third of the oven and preheat oven to 325F. Line an 8-by-8-inch baking pan with aluminum foil leaving overhang on the sides, spray with cooking spray; set pan aside. 2. In a large microwave-safe bowl, combine butter, sugar, cocoa, optional salt, and heat on high power to melt, about 45 seconds. Stop to stir, and heat in 10-second bursts until mixture has melted and can be stirred smooth. Batter will be very granular. 3. Add the vanilla, eggs, and stir vigorously until batter is thick, shiny, and well blended. Add the flour and stir until you cannot see it any longer, then beat vigorously for 40 strokes with a wooden spoon (I used metal) or a rubber spatula. Pour batter evenly into the prepared pan. 4. Bake until a toothpick in the center emerges slightly moist with batter, 20 to 28 minutes. I've made these with three different ovens and had three different baking times. Just keep an eye on it and check at 20 minutes. 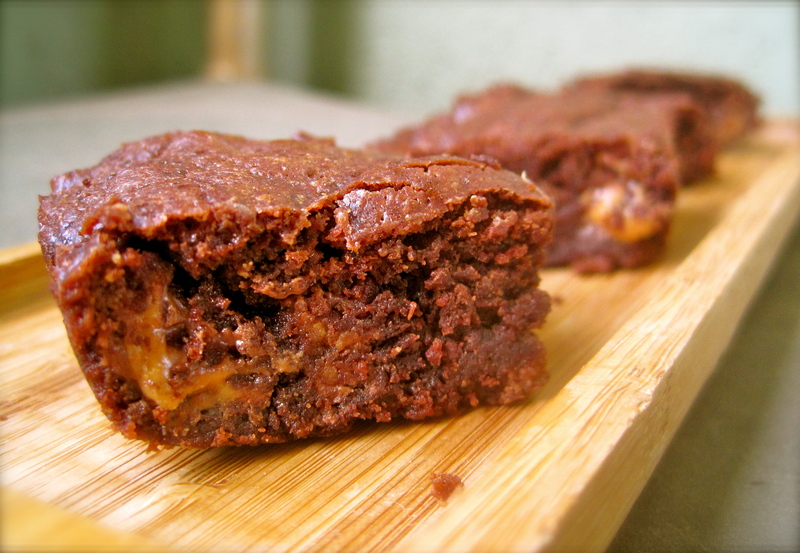 Do not bake over 30 minutes or brownies will be prone to scorching, burning, turning dry, or setting up too hard. Brownies will firm up as they cool. 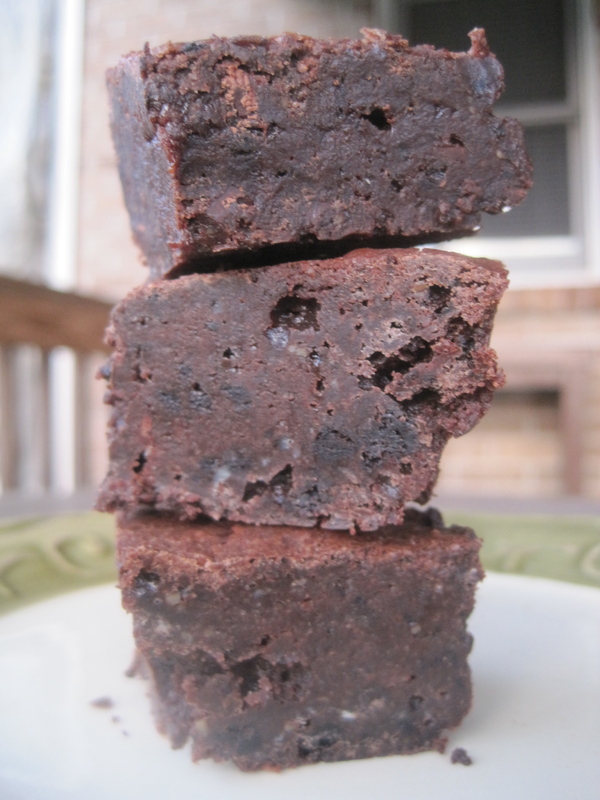 Storage Brownies will keep in an airtight container at room temperature or in the refrigerator for up to 1 week, or in the freezer for up to 3 months. 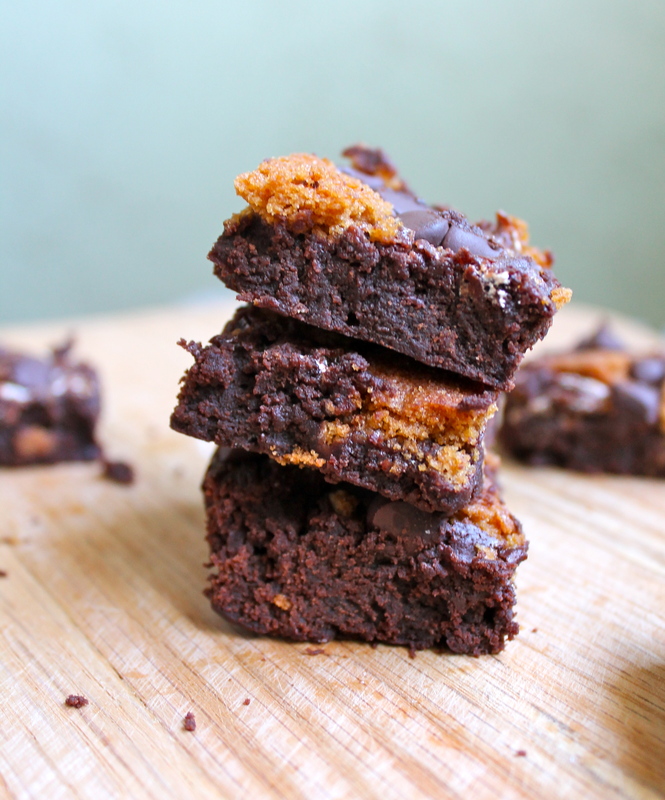 These are a super decadent treat for peanut butter and chocolate lovers. 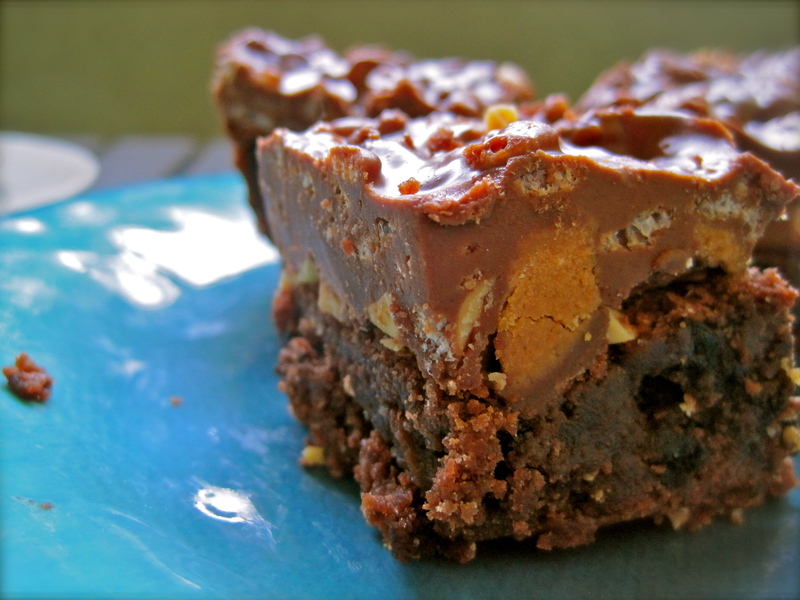 A yummy brownie bottom is covered with peanut butter cups, peanuts, and then a crunchy rice cereal topping. They are amazing! The famous Baked Brownie! A must-try if you've never tasted it!